This Tuesday, August 28, the Fitchburg Finance Committee and the Fitchburg City Council will be considering a resolution about the Cannonball Bike Path that crosses Seminole Highway just south of the Arboretum and Belmar Hills. We encourage people to attend the Finance Committee meeting at 6:30 and the Fitchburg Council Meeting at 7:30 to give their opinions about the path. Much more information is given below. The meeting is at the Fitchburg City Hall, on Lacy Road, just east of Fish Hatchery Road. Full packets for all meetings can be found at http://www.city.fitchburg.wi.us/meeting_minutes/index.php <http://www.city.fitchburg.wi.us/meeting_minutes/index.php> with the Council packet at http://www.city.fitchburg.wi.us/meeting_minutes/files/CC_082812_PK.pdf <http://www.city.fitchburg.wi.us/meeting_minutes/files/CC_082812_PK.pdf> The Cannonball information starts on page 367 of that pdf file. The fifth “article” below is about the mountain bike park proposed for county land south of Dunn’s Marsh between Seminole Highway and the Badger State Trail. 2. Way-finding signs along the corridor, especially at the connection to all the paths and trails located just south of Lovell Lane (These would include the Badger State Trail, the Southwest Commuter Trail, the Capitol City Trail, and the Military Ridge Trail). 3. A neighborhood connection path to Belmar in the Dunn’s Marsh Neighborhood. We assume this would be from the Apache Pond area, although in the past our Association has also talked about and wished for an off-road path on the west side of Seminole Highway that would continue as a boardwalk from the Cannonball south to the Capitol City Trail. 4. A 10-foot wide pedestrian island on Seminole Highway and associated roadway improvements to accommodate the island. In talks with WisDOT on 7/23/12 we were assured that there would also be striping on the road at both the Cannonball and Capitol City Trail crossings, and want to speak up for that to you as well. In addition, we suggested having caution lights for Seminole Highway motorists at these crossings. We feel this is prudent because of the additional traffic that will flood Seminole during the Verona Road construction process. Estimates are that traffic will increase by 350-450 cars during the peak hours. Of course there will also be an increase during non-peak hours also although that number hasn’t been quantified by WisDOT. There was some discussion about whether there would be an actual raised island at the Cannonball crossing. We highly recommend that and further suggest that it be wide enough to hold a family of bicyclists side by side since we expect that families will use this path. We discussed the lighting issue, and at this time we favor an unlighted path, especially past the Arboretum and Dunn’s Marsh. Since much of the area south of the Arboretum and Dunn’s Marsh is quite open, we feel that sky light will provide adequate lighting for those that happen to use the path at night. The Fitchburg Transportation and Transit Commission (TTC) supported the pedestrian island at the Seminole Highway crossing, but the Board of Public Works did not. Alder Steve Arnold, who is on the TTC, supports having the safety island. In the next section of this e-mail, I’ve included his remarks which were sent to bicycle list-serves today (Aug. 27). They give a lot of background and reasons for supporting the island. At meetings beginning at 6:30 the Fitchburg Finance Committee, and at 7:30 on Tuesday, August 28, the Fitchburg Common Council, will consider a resolution to approve the staff design of Fitchburg's portion of the Cannonball Path. Staff has proposed, and the Transportation and Transit Commission has recommended, widening of Seminole Highway where the Path crosses, and a ten-foot wide safety island, so Path uses may cross Seminole Hwy one lane at a time. This will be particularly important when Verona Road construction starts next year, as considerable traffic will use Seminole Hwy to avoid the construction. I will argue for the safety island, as recommended by staff. The widening to accommodate the island will have a traffic calming effect, which staff hopes to use to argue for a lower speed limit (e.g., 30 MPH instead of the current 40 MPH) from the Madison limits through the intersections of the Cannonball Path, Dawley Drive, and the Cap City Trail. The lower speed limit will improve safety not only for Cannonball users, but also for Cap City Trail users and cyclists on Seminole Hwy. The Dunns Marsh neighborhood Association supports the safety island. The funding for the staff-proposed safety island has already been approved by the Common Council in the capital improvement program. Saving the money for the safety island is not a good tradeoff for the safety of trail users. Citizens speaking at Council members can have a powerful effect on the Council members. If you have an opinion on this matter, please consider registering to speak in support. You can also let your Alders know your opinion directly by e-mail. Our addresses are at http://www.city.fitchburg.wi.us/government/commonCouncil/ <http://www.city.fitchburg.wi.us/government/commonCouncil/> . Background: The Path will follow the old Union Pacific right-of-way from the Military Ridge Trail at McKee Road northwest to the "bicycle interchange with the Capital City Trail, Southwest Path, and Badger State Trail, along the Arboretum and Arbor Hills neighborhood, past Leopold School, and finally cross the Beltline on its own overpass between Kayser Ford and Culvers. It will be an awesome commuter route from southwest Dane County to the Fish Hatchery Road and Park Street Corridors. The Beltline overpass and Fitchburg portions of the trail will be built next year. Snow will be removed for winter commuting. There is a map at http://www.city.fitchburg.wi.us/departments/cityHall/publicWorks/CannonballPath.php <http://www.city.fitchburg.wi.us/departments/cityHall/publicWorks/CannonballPath.php> . I just talked to Ahna [Bizjak, Fitchburg Transportation Project Engineer] about possibilities. The issue is, of course, money, for the most part, but there is a bit more. The cost for the island at Cannonball and Seminole is $74,000, and doesn't do anything for the Cap City crossing. If we put people-activated yellow flashing yield lights, the cost for a crossing is $10,000... so if we put them at Cannonball AND at Cap City, the total cost would be $20,000 and we'd have equal protection for both crossings. So that would be, what, 30% of the cost. When Finance does a compare and contrast, I'd bet that they would recommend lights. Two of Ahna's points, beyond the cost, is that we don't want to give such focus to one crossing that the other gets downplayed. People already don't respect the need to stop at Cap City when there are bikes waiting. She also pointed out that with the island, it makes the road at least ten feet wider, and people [bicyclists] that don't want to stop have that much more distance to gauge traffic. Not a problem when traffic is light or from one direction only, but a huge risk if there is traffic both ways that they need to judge. There is also some traffic calming effect to an island, but again, I'm coming around to whether putting that much focus on one crossing makes the other more of a concern. So something needs to be at Seminole and Cannonball certainly, but I'd suggest an amendment for ped/bike activated lights for both crossings in place of the island. Then if people don't want to use the lights, they have that option... but they are there to help drivers know to stop for bikes. And, yes, people should come and present their thoughts to either or both groups. 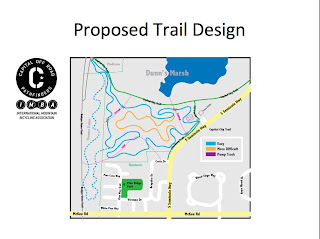 About 25 people learned a lot more about the mountain bike park proposed by CORP (Capital Off-Road Pathfinders) for the Dane County parkland just west of Dawley Park and south of Dunn’s Marsh above the Capital City Trail. The information session on August 23 was put on by the Dane County Parks Department and the City of Fitchburg. The trails would be 3 feet wide with a wheel track about a foot wide – much like a deer trail or hiking trail, NOT like a 20-foot wide cross-country ski trail. Trails are one-way only although hikers might choose to go the opposite way to be more aware of approaching bikers. Trails would be laid out by a professional mountain bike trail designer who would be working for “sustainable trail design” and erosion-free trails. Trails would be placed mostly along the contours of the land rather than up/down hill. Currently because of the invasive Siberian honeysuckle shrubs, erosion is occurring since they shade out other vegetation including grass. The map of trails you may have looked at earlier are only conceptual. Actual locations have not been decided. “Technical trail features” such as jumps would not be built. This park would be strictly for beginners who want to learn how to ride on the ground rather than on paved or gravel paths. It would be very different from the Quarry Ridge Mountain Bike Park which is located further down the Military Ridge Trail, the Badger Ridge trails, or from Cam Rock Park. It would serve young people and families wanting to get a feel for off-road mountain biking. Bicyclists age 16 and over would have to pay for a permit to ride there - $5 per day or $16 per year. Seniors age 65 or older would pay $12 for an annual pass. Riders below age 16 and hikers of any age could use the paths for free. A lot of invasive species, mainly Siberian honeysuckle and buckthorn would have to be removed from the park even before location of the paths could be decided. This work would be done by CORP volunteers. CORP volunteers would also help maintain and monitor the path. Dane County Parks will consider working with the City of Fitchburg and neighboring landowners in providing a 4-foot high woven wire fence (not cyclone fence) between County and private lands on the southern border (Pine Ridge neighborhood). Dane County would pay for the fence. Only a few entrances would lead into the park. The reason for locating a mountain bike park here would be to make beginner mountain biking easily accessible by bicycle from the nearby Capital City Trail, Cannonball Trail, and the Southwest Commuter Path/Badger State Trail. Park hours would be 5 a.m.-10 p.m. - or basically dawn to dusk. Approximately 25 people attended this information session. Attendees included several members of CORP, other mountain bikers, Pine Ridge Neighborhood Association President Kurt Miller and a number of homeowners from the Pine Ridge Neighborhood, Dream Bikes Proprietor Erik Lee, Fitchburg Transportation Project Engineer Ahnaray Bizjak, Jerry Sieling who is a member of the Fitchburg Transportation and Transit Commission, this reporter from the Dunn’s Marsh Neighborhood Association, and other interested people. Ahnaray Bizjak gave a report on the proposed bicycle hub building that will go into Dawley Park west of Seminole Highway. It will include educational information, toilets with movement-sensitive lights, a water fountain and water bottle filling faucet, benches, places to park bikes including some covered parking, and a partially sheltered deck looking down to Dunn’s Marsh. Fitchburg has a $100,000 grant from Dane County for the bicycle hub. Two meetings coming up at Fitchburg may interest those who consider Dunn’s Marsh “their marsh” and those who are bikers, mountain variety or other. Bus riders in the Dunn’s Marsh Neighborhood may want to attend the DMNA Council meeting on Wed., Sept. 5 where we will hear a presentation about potential bus route changes in the neighborhood. 1. Thursday, August 16, 9 a.m. at the Fitchburg City Hall, 5520 Lacy Road, Floor 2. Kick-off to Nine Springs Creek Stormwater Master Planning, which is supported by a $134,165 grant to Fitchburg. One feature of the plan will be a Dunn’s Marsh Stormwater Management Plan. 2. Thursday, August 23, 7 p.m. at the Fitchburg Community Center, 5510 Lacy Road, in the Fitchburg Room. This is an informational meeting about the proposed mountain bike park just south of Dunn’s Marsh and between Dawley Park and the Badger State Trail (extension of the Southwest Commuter Path). The plans for the bike hub for Dawley Park will also be reviewed. 3. Wednesday, Sept. 5, 7 p.m. at Prairie UU Society, 2010 Whenona Drive (corner of Crawford and Whenona). The DMNA Council will discuss the proposal to drop the Crawford loop on Route 19 and hear a presentation on a route to serve the Target area, West and South Transfer hubs, and the Fitchburg town hall. A map of the proposed mountain bike trails and the press release about that meeting are attached. VOTE in the PRIMARY ELECTION, this Tuesday, August 14, 7 am-8 pm. Check out the ballots - attachments 1 and 2. Madison residents vote at Head Start, Red Arrow Trail. Fitchburg residents vote at Fire Station #2, 5415 King James Lane. 1 - Primary election is TUESDAY, AUGUST 14. Resources here. 13 - Why Do Families Move Out of Our Neighborhood? 15 - Free Home Energy Surveys Available to Madison Residents. We're just a couple of days away from the August 14 primary election, when political parties will choose their candidates for U.S. Senate and House of Representatives, state legislature and some county offices. For many races, the likely winner of the November election will be chosen on August 14, so your vote really matters! Don’t be surprised by the names on the ballot. This is because of the new redistricting plan that has gone into effect since the June 5 recall elections. You can check your polling place and find a sample ballot using the Voter Public Access website https://vpa.wi.gov/ or by contacting your municipal clerk. Or simply look at the ballots attached to this e-News. Spending a few minutes to prepare ahead of time might save you an extra trip on Election Day! The partisan primary ballot can be confusing. The ballot you will receive is actually 4 ballots - 2 on each side of the heavy-duty paper ballot you will vote on. But if you want your vote to count, vote only on one of the ballots. In the August 14 primary election you may NOT vote for, say, a Republican candidate for one office and a Democratic candidate for another office. At the top of the ballot, you will have the option to designate which party's primary you wish to vote in. The choices are: Republican, Democratic, Constitutional, and Americans Elect. You do NOT have to designate the party. If you designate a party preference, only your votes cast within that party will be counted. However, where there are several candidates listed for a particular office, you must choose one, or none will be counted for that office. It really makes sense. How could the tabulator know which candidate you want when, say, you chose the Democratic primary, but there are 3 Democrats to choose from for a particular office? If you do not designate a party preference, you must still cast your vote within one party, or none of your votes will be counted! So, keep all of your votes within one party for this primary election. 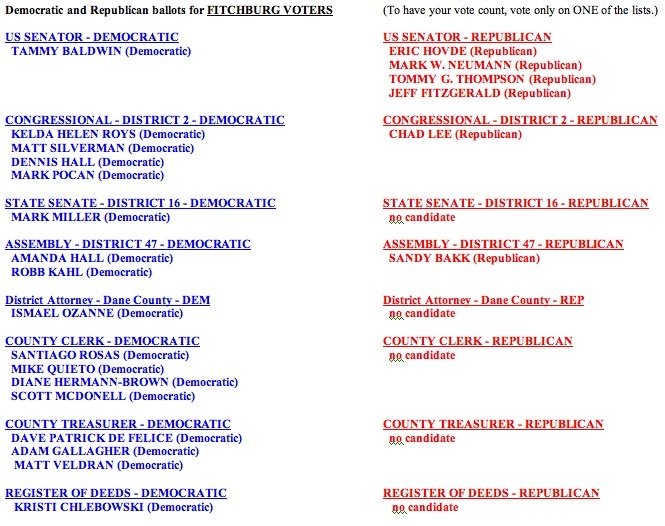 A “write-in” option will be available for each position within each party listing, but don’t make the mistake of writing in a candidate from another party, or your vote won’t count. Now...get ready, get set, and VOTE! 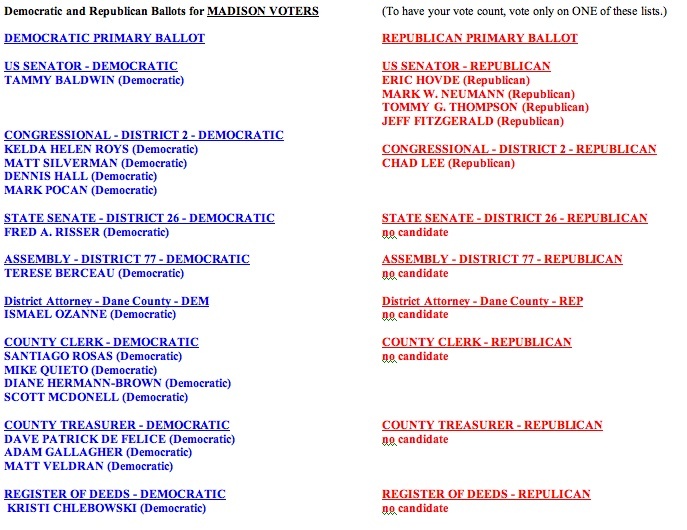 Sample ballots for Madison and Fitchburg voters are attached. Here’s what you’ll see. First of all, the ballots for the Constitutional and Americans Elect parties are not shown since neither party fielded any candidates. 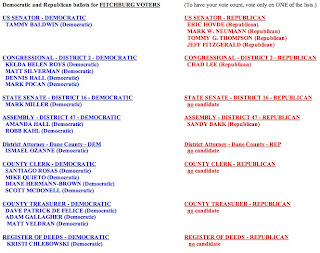 Be assured that if you want to vote in either of those parties, you may write in a candidate. But only vote in that primary and don’t write in the name of any candidate that appears on the Republican or Democratic primary ballot or your vote won’t count. Most of us will choose to vote in either the Democratic or Republican primary. The ballot you will get at the Madison polls at Head Start on Red Arrow Trail or at the Fitchburg polls at Fire Station #2, 5415 King James Way, will differ in only two races. Madison voters are in State Senate District 26 and State Assembly District 77. Fitchburg voters are in State Senate District 16 and State Assembly District 47. 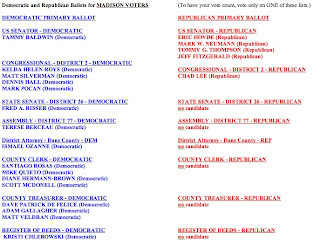 Voters in the Madison Democratic primary for Senate District 26 may vote for Fred Risser or write in a candidate. For Assembly District 77, Madison voters may vote for Terese Berceau or write in a candidate. Risser and Berceau currently hold these posts. Those who are voting on the Republican primary ballot may write in a candidate for Senate District 26 and Assembly District 77. There are no Republican candidates for these seats. Voters in the Fitchburg Democratic primary for Senate District 16 may vote for Mark Miller or write in a candidate. Mark Miller holds this position now. For Assembly District 47, Democratic primary voters may choose between Amanda Hall or Robb Kahl, while Republican voters may either vote for Sandy Bakk or write in a candidate. This is a vacant seat at present. Again, remember that you may vote in only one primary. You can’t vote for a Republican and then skip over to vote for a Democrat for the same or a different office. Residents who are eligible to vote but haven’t registered may register at the polls on Tuesday, August 14. The trick is to bring the correct documents to the polls. Everyone who has been issued a Wisconsin driver’s license must provide that information on the registration form. A Wisconsin ID card will work in place of a license. Residents without either one need to provide the last 4 digits of their Social Security number. Residents must also provide proof of residence at their address in the neighborhood. The Wisconsin Governmental Accountability Board lists the following items as valid proof of residence as long as they contain your first and last name and current and complete residential address. Fitchburg is about to undertake a big stormwater study and action plan for the Nine Springs Creek watershed. The watershed begins with the Dunn’s Marsh drainage basin, and $15,850 of the $134,165 grant total is especially dedicated for Dunn’s Marsh. Dunn’s Marsh residents interested in the marsh are especially invited to the kick-off meeting for the grant. It will held on Thursday, August 16, 9 a.m. at the Fitchburg City Hall, 5520 Lacy Road, Floor 2.
since the presentation part of the meeting will be videotaped. For more information, read below and/or contact Rick Eilertson, Fitchburg’s Environmental Engineer, 608.270.4264, 608.235.0412 (direct) or rick.eilertson@city.fitchburg.wi.us. The DNR stormwater master planning grant awarded to Fitchburg will include a Dunn’s Marsh Management Plan. Dunn's Marsh Stormwater Management Plan - This proposed plan would include an evaluation of the 1994 R.A. Smith recommendations, preliminary stormwater quantity and quality monitoring, water sampling, sediment depth probes and sampling, provide a vegetative and aquatic inventory analysis, and recommendations for future management and maintenance of the Dunn's Marsh Watershed. Periodic meetings between the City of Fitchburg, City of Madison, and UW-Arboretum would be incorporated during critical stages of the plan. 1. 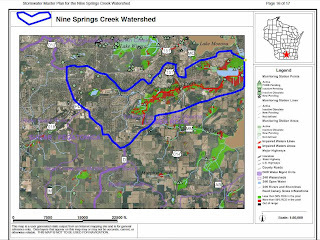 Compile historical information on stormwater facilities in the Nine Springs Creek Watershed. 2. 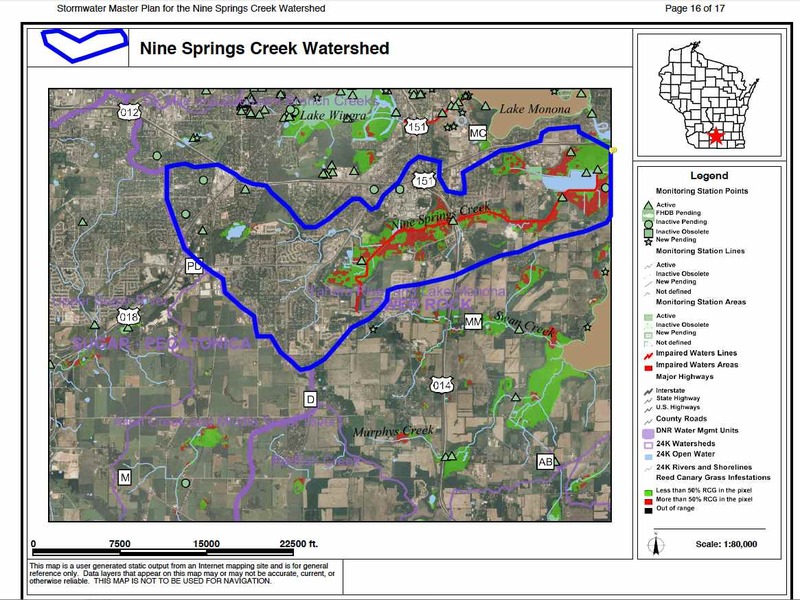 Conduct a minimum of 3 public information meetings with the stakeholders in the watershed: residents, business owners, adjacent municipalities, school districts, DMNR, Dane County, local civic groups, and other interested parties. 5. Make financial recommendations for changes in the rate schedule for the Fitchburg Stormwater Utility. The purpose of this memo is to provide you with an update on the status of the Cannoball Bike Path project and the design elements that are being recommended by staff for final design as well as the schedule for the approval process. 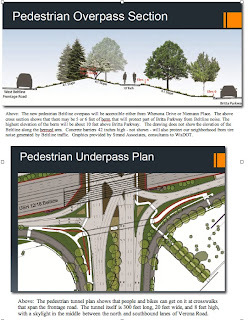 Due to budget constraints, city staff is not recommending a second connection to Capital City State Trail on the west end, as was shown with the 2-bridge design option. Also, due to budget constraints and current opposition to lighting, city staff is not recommending lighting at this time. To document these recommendations, staff has prepared Resolution R-77-12, Approving the Final Design Elements for Cannonball Path, which will be acted on by various committees or commissions at the following dates and times. Please feel free to attend these meetings or contact me with any questions, comments, or concerns with this project by phone at 270-4262 or e-mail at ahnaray.bizjak@city.fitchburg.wi.us. project. We worked with the DOT to remove the rail spur that was used to store coal cars. We wanted to prevent personal vehicles from parking in this area (during football games especially) so we will be planting a mixture of native prairie plantings and shrubs along with some strategically placed large boulders. DOT was OK with this as they consider this type of landscape treatment temporary. They are maintaining ownership of the corridor in case sometime the future they need to return rails to this corridor (yah, right!). We just have use and maintenance agreement with DOT to do the landscaping." 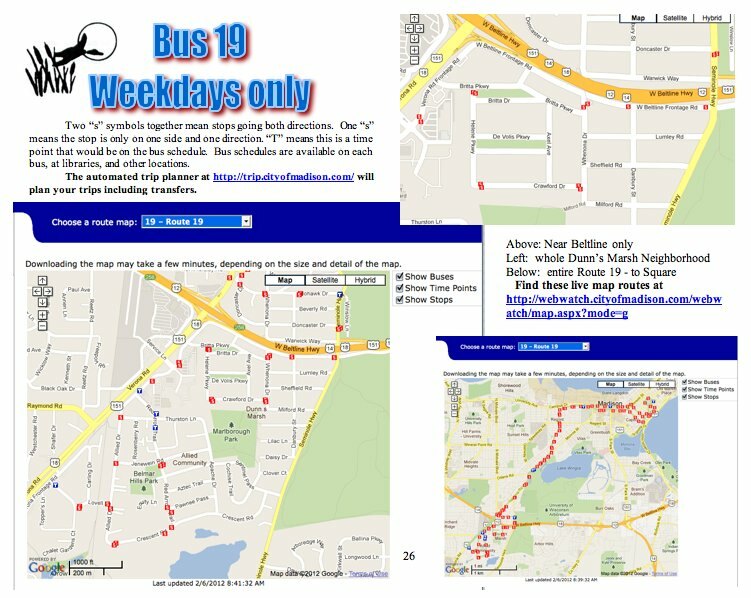 Are you a Madison Metro Bus rider on Route 19 that winds through the neighborhood? Or have you ever wished you could take a bus to the Fitchburg Library or City Hall Then you will want to attend the September 5 meeting of the Dunn’s Marsh Neighborhood Council. There is a suggestion by the Madison Transportation Planning Board (a.k.a. 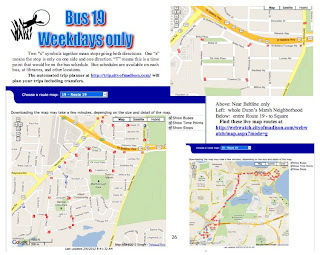 "MPO") staff that Metro route 19 not deviate to Crawford Dr, but instead operate only on the frontage road through the Crawford area (at both peak and non-peak times). The proposal would be in the MPO's 5-year Transit Development Plan, to help guide Metro service changes, and so the change is not eminent, but in the draft it is priority 1 (1-2 year time frame). The intention is speed the route so it can more reliably complete each run per its schedule. It would be about 0.3 miles (6 min. walk) from the center of Crawford to the nearest stop. We have been asked how the neighborhood would respond to this change of route. 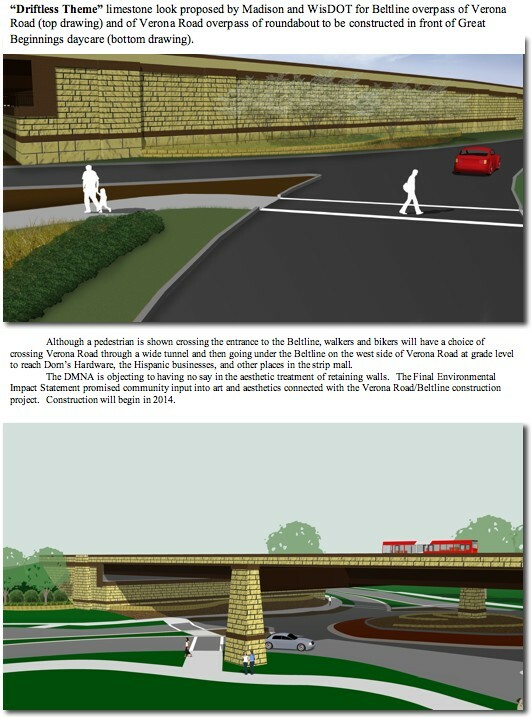 If you attend the September 5 meeting, you’ll have a chance to let us know how the DMNA should respond to the proposal to drop the Route 19 Crawford loop. Secondly, Mr. Arnold, as a private citizen, is proposing new transit service that would serve the east side of the neighborhood. His route proposal would allow riders to access not only Target and other businesses on PD/McKee Road but also the West and South Transfer points and the Fitchburg Library and City Hall. Arnold will be giving a half hour presentation on his proposed route at the September 5 DM Council meeting. The meeting starts at 7 p.m. at Prairie UU Society, 2010 Whenona Drive, corner of Whenona and Crawford. 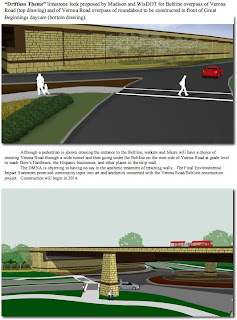 The Verona Road/Beltline construction project is in the “design” stage. Take a look at some of the proposed designs that are attachments to the e-News. West Beltline travelers will have noticed that American Transmission Company’s high voltage lines have now reached the Todd Drive area. It will only be a matter of time before they are strung on the poles that pass the Arboretum and the Dunn’s Marsh Neighborhood. When activated, ATC’s new lines will carry 345 KV of power. 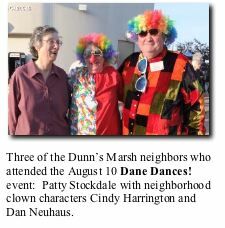 Some 30 attendees at the annual Dunn’s Marsh Neighborhood Picnic had an unusually good time on Friday, August 8. Because of the hot weather, everybody moved to the shady and much cooler shelter in Marlborough Park. It was a good decision, not only because of the heat, but because there were plenty of picnic tables. Potluck food was excellent, and people visited while grilling meat burgers, veggie burgers, and sweet corn. Since the group was manageably small, everyone introduced themselves. The real fun began when a couple of neighbors got out their guitars and song sheets. Then, in the middle of the singing, Cindy Harrington performed some Hawaiian numbers that got several people up and dancing with her. Everybody had a good laugh while the dancers got a good deal of exercise. By the second time the park ranger came around, it was too dark to see the song sheets, so we all picked up and left. From the neighborhood association point of view, this was also a successful picnic because over a third of the attendees had never been to the DMNA picnic before. It was a nice mix of old and new. We hope more of you attend next year. The first family moved to Brooklyn, a small town about 18 miles south of the Dunn’s Marsh Neighborhood. Here’s what they said about their reasons. [We] moved to the neighborhood in 2004 to rent the duplex on Crescent Rd. Newly married and was a short commute to work and a very nice neighborhood. We thought we would stay only a year or two and then buy a home. Well, we kept enjoying the commute and less expensive rent so we stuck around. We had our first child in 2010 and the accommodations felt smaller (only a two bedroom) so we began our search of where we wanted to live. We weren't in a huge hurry until our second son was born in 2011. Then we decided that while we love the advantages of the Madison school district, we would prefer to raise the boys, at least while they are young, in a smaller community. Brookyln is close enough to Madison. Plus my husband's sister and their children live in Oregon so it seemed a good fit. I think that the neighborhood association did a good job trying to make the neighborhood feel like a community within a community. We had only planned on being in this house 3-5 years (we were here 5 years in June), but the real deciding factors were the fact that we are having a second child this winter which would make selling/moving very difficult next spring. We want more space, 2 stall garage, and a basement, for our growing family, and the rates are so incredibly low right now - it's a great time to buy. We're sad to leave - this neighborhood has got the BEST location! We worked (and spent so much money) updating our house; hard to leave it, but in the long run we know it's the right decision. The new owner seems very nice and I think she will keep the place up very nicely. The DMNA Welcoming Committee is aware of new families who have moved in on Danbury, Windflower, Clover, and DeVolis. The Committee is giving them copies of our Welcoming binder that is filled with loads of positive information about the neighborhood. If new people have moved in near you, let DMN Committee Chair Thea Bach know at 274-7730, 239-9810 or bachtown2@live.com, or send addresses and names, if you know them, to the newsletter contact. Thanks to neighborhood resident Nathan Counley for keeping us informed about Windflower Way newbies. Presenter Caitlin Buhr, an AmeiCorps/WISPIRG worker, talked about many ways to save energy at home. It’s not only to save money - Madison disconnections rose 30% this year - but also to save the environment. Here are some things she mentioned. · Block cracks that let in drafts or allow heat to get in on hot days. · Use your blinds or shades to keep out the sun on hot days or keep out the cold on cold winter nights. · Insulate your attic well. · Raise your thermostat in the summer to 78º F for days you use the air conditioner and to 68º F on days when you use the furnace. For every degree you raise the cooling temperature or lower the heating temperature, you will save 5% on your cooling or heating bill. · Change your furnace filter often, at least every 1-3 months. Heating will be more efficient. · Lower your water heater temperature. If you can’t hold your hand on the hot water pipe near the heater for 20 seconds or more, the temperature is too high. Hot water temperature should be no higher than 120º. · Use low flow fixtures. Aerated faucets are good. · Beware of “vampire” energy users - where electricity is used even when an appliance or item like a TV are off. Of course you can pull the plug to stop the vampire, but putting items like TV, VCR, DVD player on one strip plug that can be switched off is much easier. “Vampire” usage accounts for about 10% of American energy use. · When you buy a new appliance, look for the energy star models that will save a lot of energy compared to standard models. · Where possible, use compact fluorescent lights - CFLs - or LED lights. Monday, August 27, 2012 at 6:30 p.m. Please join Shane Olson, Crime Prevention and Gang Officer and Meadowood neighbors for his presentation on gang activity in Madison neighborhoods. Officer Olson routinely conducts home visits of at-risk youth, updates district staff with current street gang trends and works closely with our Memorial ERO and middle schools. The Madison Senior Center will be presenting a Health and Resource Fair on Thursday, September 13. Get free health screenings and pick up health information on from 9:00-11:30 am at the Madison Senior Center close to the Square at 330 W. Mifflin Street. This event is open to the public. Health Screenings will be offered for Bone Density, Eye Pressure Test, Blood Glucose, Pulse Oximetry, Spinal Screening, and Blood Pressure. Free Chair Massages and more will also be available. There will be lots of giveaways and prizes and presentations on hydration and nutrition. You could also join a bingo game at 1 pm. Dane Dances! with live bands, takes place each Friday in August on the Monona Terrace Rooftop. It is a free event with the specific objective to provide a diverse environment and grow relationships between people of different backgrounds in Dane County. Through music, dance, and food, we have created a quality program that has successfully brought people from all racial, ethnic, and social backgrounds together. Mission Statement: Entertaining neighbors, families, and communities since 2000, Dane Dances! has established a solid reputation as a local event by drawing thousands to rooftop of the Monona Terrace every Friday evening in August. Founded in 1999 by ex-New Yorker Peter Anderson, Dane Dances! is a non-profit volunteer organization committed to providing FREE and diverse entertainment to the public. A generous grant from Madison Gas & Electric and volunteers from the Study Circles on Race program made the first Dane Dances! series possible, attracting people from all walks of life.